Discoveries revealed in camp excavation of legion that destroyed ancient Israel, at site where war for final redemption believed to begin. Remarkable new discoveries have been unearthed from an excavation of a Roman legion camp in Tel Megiddo, located in northern Israel and hailing from the days of Roman occupation of the "province of Judea" nearly 2,000 years ago. The excavation began in 2013, and saw the Jezreel Valley Regional Project join forces with archaeologist Yotam Tepper to dig just south of Tel Megiddo, where they discovered the camp. Far before the Romans occupied parts of Israel and eventually expelled much of its indigenous Jewish population, Tel Megiddo was an important Canaanite city-state up until the early 10th century BCE. It was later a pivotal center of the Northern Kingdom of Israel in the 9th and 8th centuries BCE. According to certain interpretations of Jewish tradition, Megiddo is also the site where the war of "Gog and Magog" will begin, in which Israel will defeat the descendant of Edom - identified with Rome - ushering in the final redemption. At the time of Roman emperor Hadrian's reign (117-138 CE), two imperial legions were stationed in the province of Judea: Legio X Fretensis in Jerusalem and Legio VI Ferrata in the north. Legio VI Ferrata, or the Sixth Ironclad Legion, was based in the Jezreel Valley near Tel Megiddo and was deployed between the First Jewish Revolt (67-70 CE) and the Bar Kokhba rebellion (132-136 CE), two Jewish rebellions which aimed to return Israel to Jewish sovereignty and end the Roman occupation. The legion remained stationed in Judea through most of the 3rd century CE. The legion was positioned to control imperial roads and access to the Galil, where much of the Jewish population was centered after the destruction of Jerusalem and the Second Temple during the First Jewish Revolt. Textual evidence had indicated the legion's camp was somewhere near Megiddo along the road spanning from Caesarea to Beit Shean. But discoveries in the new project would seem to indicate the exact location of the camp, and various important cultural finds along with it. 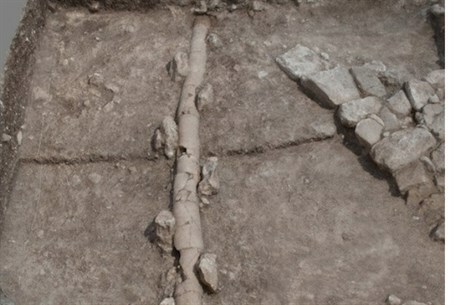 Yotam Tepper found coins and roof tiles stamped with the Sixth Ironclad Legion's name in a large field near Tel Megiddo as part of his Ph.D. research at Tel Aviv University. Aerial photography indicated a large rectangular structure, similar to a barracks, was just below the surface with depressions surrounding it. After work began in the summer of 2013 on the Jezreel Valley Regional Project, the long-lost camp was finally unearthed. Defensive trenching encompassing the foundations of a massive wall six meters (20 feet) wide were discovered, and inside the wall rooms of the apparent barracks were found. In them were ceramic roof tiles with the legion's mark, coins, fragments of scale armor, and other significant finds. The Via Principalis, or Main Street, of the camp was also identified. Water pipes and sewer channels, as well as a large building that likely housed the commander of the fortress, were all revealed in the camp, which spans 300 meters by 500 meters (984 feet by 1,640 feet). A full 5,000 Roman soldiers had been residing at the camp. The find is unique in that it is the only Roman military camp of its kind to be discovered in the eastern half of the Roman Empire.